This roomy comfortable small pet cage will be the talking point of your living room. Your pet will get plenty of exercise chasing around the various levels. Also included is a little wooden cabin where your pet can sleep and hide. The front of the cage is plexiglass so you can watch your pet´s antics. The wire mesh top is simple to remove making it easy to feed your pet and clean the cage. 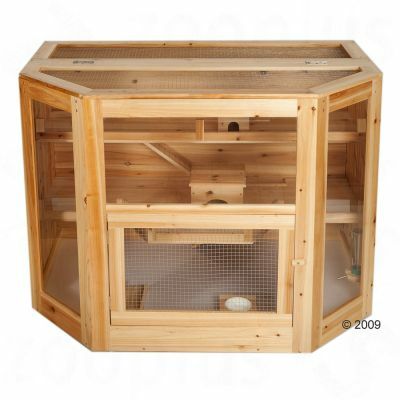 The Small Pet Cage Nogales is made of pinewood the glaze of the barn and the accessories is not toxic to animals. Size 120 x 75 x 90 cm (L x W x H) Accessories 2 solid wood storeys 2 ladders 1 wood cabin Please note The cage is flat packed for transportation. Easy assembly. This product cannot be delivered to Northern Ireland.